Through our prenatal classes and coaching sessions, you can learn how to reduce daily stress, practice mindfulness, and improve your overall sleep quality. We all have healing energy ... let's learn to use it! “The Mellow Mommy Method of Manifesting” …a meaningful family life of your dreams. This coaching originally started off as a class for pregnant moms 15 years ago (as I had lots to share having 2 young children...thinking I found THE way to stay sane...MASSAGE! It still is...along with a lot more! It all comes down to staying PRESENT...living in "The Now"…and DAILY SELF CARE! I'm so proud of how the class has evolved over the years to this transformational coaching series teaching valuable skills for living well - teaching The Mellow Mommy Method of Manifesting…offering Energy Healing attunements for Self Care + Daily Practices (using The Law of Attraction). In this fun, hands-on coaching session, you'll learn KEY ingredients for purposeful, joyful living: REIKI SELF-CARE, DEEP BREATHING, MEDITATION, ENERGY HEALING / MASSAGE & THE LAW OF ATTRACTION. The Coaching is CUSTOM Tailored for your specific group. Tap into your HIGHER WISDOM…and discover your soul’s purpose. ... Helping expecting couples gain a better understanding of what their partner might be experiencing during these transitional months of pregnancy. Along with all the joy & excitement this new journey brings ... pregnant couples also feel stressed, anxious & fearful. The coaching offers easy relaxation skills that help BOTH Mom & Dad. With specific massage techniques designed to relieve the discomforts of pregnancy, Dads-to-be learn to confidently help their "baby mama". Moms learn simple massage to ease Dad's stress with minimal effort. This helps with daily stress reduction & strengthens CONNECTION...The CORE of a HAPPY, HEALTHY FAMILY! The "Prenatal Couples Art of Relaxation" coaching session is included in a Mellow Mommy Babymoon Package. ...For any stage of Motherhood (Mommy, Mom, Mother, Grandmother, God-mother, Auntie.) Mom's are the "glue" that hold the family together! Take the time to nurture YOU...RELAX, RECHARGE & RECONNECT with your INNER SPIRIT!...& with your girls! We all need to connect with our "Goddess Tribe"..."Sisterhood", nothing quite compares to that connection! It provides a grounding HEALTHY balance for the soul...along with SELF CARE! A refreshing fun time with girl friends while learning valuable skills for nurturing the caregiver we all are as women. Refuel & Refill the Glue! 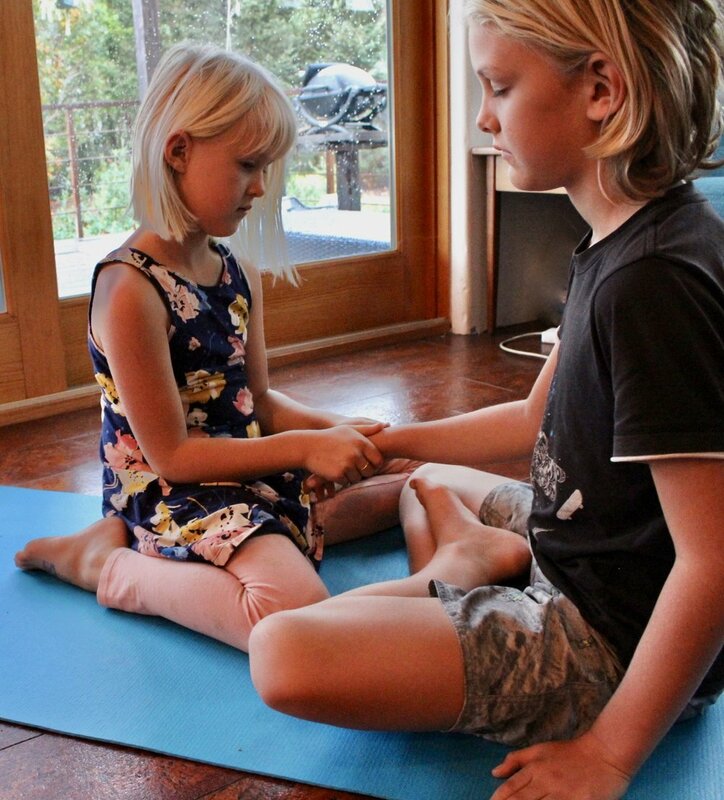 Learn REFLEXOLOGY & ENERGY HEALING to share with your family! Great for Mom's Night Out, Girlfriend Getaway or Family Reunions. MINDFULNESS ... This coaching was designed to teach you to relax & be grounded ... anywhere, anytime. ANXIETY RELIEF ... Learn simple relaxation skills for daily stress reduction. REFLEXOLOGY ... Something as simple as stepping on a rock can help you feel grounded instantly while stimulating nerve endings. ENERGY HEALING ... We all have healing energy within us, right at our fingertips. Physical contact, even just a pat on the back can be healing ... and strengthen your CONNECTION! ... Learn to EMBRACE this beautiful transitional time of pregnancy! The flood of emotions experienced during pregnancy can be overwhelming. Learning to manage the challenges of becoming a new mom require a strong sense of self & inner peace. Moms will learn Reiki Self Care + Meditation, Deep Breathing, and Stretching techniques that will help to HARNESS your INNER MOMMY STRENGTH! Pregnant moms will also learn infant massage (practiced on a baby doll) & get a video download of Mellow Mommy & Me - Infant Massage routine that incorporates infant massage with meditation, yoga & strengthening exercises for MOM ... a "win-win" for Mom & Baby! ... For couples & families. I'll come to your vacation rental or home with pillows & mats for your personal retreat. Have fun together learning valuable skills for living well with guided meditation, energy healing, partner massage & stretches for the whole family. We all have healing energy within us, right at our fingertips ... and FEET too ... Learn the basics of ENERGETIC BALANCING with simple foot SHIATSU. It's a lovely addition to a Spa Day in the privacy of your Sonoma County Vacation Rental... your own personal RETREAT that comes to YOU! "You're not only receiving one of the best massages you could ever receive, but you're also learning to incorporate relaxation techniques into your everyday life. Cindy came to our cottage with mats, music, pillows, and other objects to help teach us simple relaxation techniques. It was such a hands-on lesson. She guided us through all of the techniques, allowed us to practice, and provided us with a colorful booklet for us to keep as a guide. The foot reflexology techniques are something that we have continued to use almost every night - it's really as simple as stepping on a stone." "Thank you Cindy, I'll be back!" "Cindy's presence was immediately warm and safe, as if she was an old friend. She taught me practical massage techniques that I can share with friends, as well as she taught me relaxation techniques that I can utilize in my daily life. Cindy also treated me to the most relaxing, energetically healing massage that I could have asked for on my birthday." "Cindy is a skillful instructor"
"My wife and I had the pleasure of meeting Cindy during a recent stay at a Retreat Center. We signed up for her 'Mellow Mates' massage class. Cindy is a skillful instructor who does a terrific job of getting to know her audience and tailoring her lessons to meet their needs and expectations. My wife and I both learned a lot about massage therapy and enjoyed getting to know Cindy in the process."